Welcome to my newly simplified monthly sales report by price band. I hope you find this format more useful. Since prices have come down so significantly since I started tracking local housing numbers in 2005, revised price bands reflect our new reality. In January prices were down, but unit sales were up as the under $400K range continues to flirt with balanced territory. Please take note of, however, our whack-a-doodle inventory levels in the over $400K range, especially for homes over $1 million… I still believe the local high-end market has yet to capitulate. So all you luxury cash buyers out there waiting for the other shoe to drop? Keep waiting. Though some of these sellers may have infinite cash reserves and the ability to wait out a ten-year market downturn, many others do not. Of a total 4,104 active listings, we saw 265 sales in January 2009 versus 204 in January 2008, an increase in activity of nearly 8%. Of particular interest is the high number of pendings in the queue at 1,012, the highest number I’ve seen in a long time and much higher than last month’s 712. (I went back twice just to make sure there was no mistake.) As pendings are a leading indicator of closings to come, it will be interesting to see how many of these actually materialize into sales next month. Data courtesy of NNRMLS, January 2009. 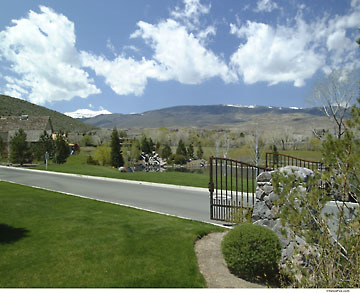 Includes Stick-Built Single Family, Condo/Townhomes, and Real Property Manufactured Housing in Reno-Sparks (Area 100). This entry was posted in Market Trends, Market Trends, Reno, Sparks and tagged data, Market Trends, stats. Bookmark the permalink. Let’s see, 198 months of inventory. That would be 16.5 years of inventory. Which means, that if not one other house comes on the market priced over $ 1 million, it would take until 2025 to sell all the houses in that price segment now listed on the MLS. 16.5 years? Is that a national record? Is there anywhere in America where there is 16.5 years of inventory in a price segment? So 265 houses sold last month, and 249 of them were under $400K. Only 6% of all sales were over $400K. And yet, the slideshow on the right of multi-million dollar houses rolls on. I really hope you guys are not spending a lot of money to market these places. The under $400K range is flirting with balaced territory? Only a realtor who came into the business in the midst of the biggest speculative bubble in history could say that 13-14 months of inventory is “balanced territory”. Go to any text book on real estate, written before the bubble, and you will see that a healthy market is regarded as one with 5-6 months of inventory. Now, compared to 198 months of inventory, which is a Twilight Zone number, 13-14 months may look good. But in realty it stinks. That 13-14 months of inventory for the bottom end of the market has been holding steady for at least the last two years. And, as we all know, the median has dropped more than 30% in that time. So yes, 13-14 months of inventory does stink, and the dropping median has been reflective of that over the past two years or so. The 44 months of inventory in the over $400K range is actually getting worse. I think it doesn’t take a Ph.D to figure out where prices will go in any price range that has 44 frickin’ months of inventory. Diane! You’re alive and well. Kewl. Don’t be gettin’ all depressed on us. As much as that boat anchor of a house might be weighing on you, bear in mind that most of us are getting throttled in one way or another by this economic depression. Unemployment hit 11.5% in my county and they’re forecasting 15%, soon. Ugliness. I’m going to have to echo the sentiments of the previous posters- there’s a serious inventory problem going on in ALL price segments. You’ve just got to laugh at those delusional individuals and their “million dollar homes.” I’ve got news: those ain’t million dollar homes. Nuh uh. Nope. Nada. Cratering prices, here we come! Sit back, and watch the carnage. SkrapGuy, I was taught that under 6 months is a seller’s market, 6-12 months is generally balanced depending on region, and that over 12 months is a buyer’s market. Yes, perhaps the term “flirting” was a stretch for the $200K-$400K range, but it very much applies under $200K. Hey, here’s a question . . . The obvious reasons for lack of sales have been well-discussed: too much inventory, and too little money, among others. Has there been a change in the population here in Reno-Sparks? Does anyone know if the rental market (incl. apts) is up or down (rates and/or occupany rates)? While some folks will move in with their relatives (or friends), that doesn’t usually last long, and I suspect the numbers are low anyway. There are more homeless–the shelters are busting at the seams. But have people actually pulled up stakes and left? Speaking of so-called million dollar houses that never were million dollar houses that aren’t million dollars houses anymore, take a look at MLS # 90002830. 4271 Dant Blvd. This house, of course, has been the subject of conversation here on the RRB before. I’m sure you remember it well. Good to hear from you Diane!! But aside from that, I’d like to respond to longerwalk, since I’ve become a renter since I lost my house. In my complex, the manager and assistant manager quit, after the owner (absentee from TX) installed a new manager. My rent is $935/month, on a month-to-month lease. I could have signed a one-year lease with a $200 discount to March’s rent, but I don’t like the new manager. The apartment I was looking at moving into has been vacant since October 2008. The one next door to me has been vacant since the occupants were evicted in August 2008. I see many apartments with low deposit deals, free rent for a month if you sign a 6-month lease, and that sort of thing (I live along Virginia Lake). Meanwhile, I can rent a house in the same neighborhood for $1000/month. But of course I’ll check the status of the owner’s deed of trust before I even fill out an application. I don’t want to get evicted because of some dumb landlord’s NOD. I think a lot of people have left town since the construction business dried up. There seem to be plenty of rentals available all over town. Ahh, yes RI, I sure remember that one well. Why that’s Allen “I don’t have to sell so I won’t reduce my fantasy price because I’m a good fisherman though this recession is biting hard so think I’ll sell off all my toys and go back to work cause I’m not rich and ouch this Mcmansion payment hurts like hell better yet maybe I’ll make a few chintzy price cuts but I’m not giving it away going to follow the market down” Murray! For some reason, I just can’t imagine people lining up to pay more than 4 times the median price for that energy hog on a tiny lot. Can you? I smell an NOD. That house on Dant is hardly a “new” listing. If I recall, that house was on the MLS for many, many months, wasn’t it? Also, if I recall correctly, the asking price was around $1.1 million, wasn’t it? Or I am mistaken? If we had an open MLS, the pricing history af a house by address would be available to all, but the realtors sure wouldn’t want that to happen would they? Two realtors in the rental market told me the “Mexicans have left,” so I guess they’ve been dealing with low income rentals and are seeing some population movement, but I’d not draw too much from such comments. But some multifamily properties are now selling close to 100K! 620 7th Street is a triplex that has seen better days. Nice to see your post Diane! Hope you are doing well. I think you may be on the right track with your balanced comment, just not what you’d historically say was balanced. Normally in a downturn you see the effects of sticky downward prices — prices don’t drop to market clearing levels and, as a result, you don’t have many sales, and those that do occur are usually what are called “distress” sales. In the low bands there are so many distress sales that there is actually a fair amount of activity. This is indicative of a bottom so in some abstract sense the bottom tiers are in fact “balanced”. Ultimately the lack of new housing starts and new household formation will drive prices upwards. Whether owners in the upper bands can wait for this to occur or whether their homes become distress sales is the open question. Probably depends on the economy and their personal situation, but the current status could continue for quite a long time.